The aftermath of the completion of a cross cultural research in a conflict ridden context, rather than finding me satisfied and content with my newly acquired knowledge, finds me puzzled, confused and more inquisitive than even. Having completed a long research journey, I now want to lay my theoretical ammunition on the ground and break free from the confines of the PhD standardised discourse. I do not wish to claim illusory validity and I no longer hope to lure you into believing my epistemologically framed fictions. It is now time to reflect, contemplate and pose more questions than provide structured answers. The green line of Nicosia, dividing the island of Cyprus between Greek Cypriots and Turkish Cypriots, was constitutive of the research context my study located itself. Crossing that line had political, practical and ethical implications which constituted a baggage, which I, as a Greek Cypriot researcher, had to carry. And that line was, by no means, the only one I had to cross. As I was stepping to the other side of the island, I realised I had to avoid struggling between my two simplistic images of ‘the Other’. As hordes of faceless soldiers jumping off collectively shared stories contradicted smiling faces and honest encounters with Turkish Cypriots in real life settings, I knew I had to navigate away from the naive boundary between the ‘good’ and the ‘bad’, the ‘fictional’ and the ‘real’. That boundary had to be complicated and opened up for interrogation. As my research progressed however, my understanding of the ‘Other’ evolved and I became familiarised with my own undecided otherness as an insider/outsider conducting research in a divided context. Similar to the experience of several cross cultural researchers, I too, had difficulty identifying where the separating line between insider and outsider status was. As a female Greek Cypriot researcher conducting research both in the Greek Cypriot as well as Turkish Cypriot community, I was perhaps what Trinh (1988) had defined as ‘the inappropriate other’, not quite the same, not quite the other, standing at that ambivalent place between ‘us’ and ‘them’ not only interculturally but intraculturally as well. The following incident will illustrate this undecided status I held as a researcher and how my subscription to particular epistemic practices differentiated me from members of my community, denied me sameness traits, singled me out of my group and eventually defined me as an ‘Other’. When my research began to receive publicity in Cyprus, at an interview I talked about the books I used in my investigation as an exploration tool. The writer of one of these books was born and raised in a town at the north part of the island, but due to the events of 1974, was forced to abandon, the town now being under Turkish Cypriot control. The exact geographical area, however, where this particular town is located is defined differently among Greek Cypriots and Turkish Cypriots according to the contrasting interpretations they attribute to the events of 1974. 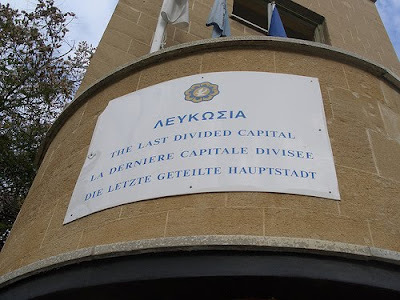 The north part of Cyprus is referred among Greek Cypriots as ‘the occupied [land]’ /ta katechomena edafi/ while among Turkish Cypriots it is known as the -internationally unrecognised- Turkish Republic of Northern Cyprus. Trying to plot a route between the two opposing definitions, in interview, I said that this particular book can be seen as the writer’s own way to realise an imaginary trip to the land she considers as hers. Upon reading the interview the writer emailed me complaining about this. ‘I do not consider it. It is mine’, she protested, addressing me now in polite plural, distancing me and redefining our previous close relationship. The words I had used, however, were not a consequence of a misunderstanding on my part of what the writer had said and which I could potentially correct or rephrase. It was not an issue of unfortunate terminology. Neither was it a failure on the writer’s part to acknowledge my speech as a neutral way of expressing myself due to my researcher’s positionality. It was not an issue of me disclosing personal information or offering an offensive description. This was rather a clash of epistemological understandings about what constitutes land, identity and ownership. Equally, through my epistemic practises, I asked for her understanding and she gave me her truth, I aimed for her perception and she gave me her reality. Different approaches, one would say. An ethically sensitive, more nuanced understanding of this particular event would not dismiss it that simply however. For my research participant felt wronged. Misrepresented. But what they were really protesting against was having their speech framed within a research premised on a set of constructionist assumptions. As a researcher I rejected essentialist or culturally particularist suppositions because I felt that more comprehensive insights about the particular topic I was investigating could not be gained in this way. I worked and presented my ‘findings’ or researcher’s interpretation, under the assumption that identity definitions are and can be no more than social constructions of ‘realities’ that are indeed subjectively real for those who share the constructs. Yet, my subscription to this research epistemology seemed incongruent with this particular participant’s viewpoints feeling they had to make a robust response and raise my awareness not on what they had really said, but to tell me that the world is this way. I became friends with the writer during the course of doing research, but for them I am now a researcher. Why is that? Is it because despite the fact that we are both Greek Cypriots and we have both been subjected through, perhaps, similar discourses, I have different views about certain issues? Had I been unjust and unethical to them? Had indeed my epistemological choices and practices discredited my participant as a knower and interpreter of the world? If I had followed a declared partisan research stance, would we still be friends? Trinh, M. T. (1988). Not You/Like You: Post-Colonial Women and the Interlocking Questions of Identity and Difference. In D. Gordon (Ed. ), Feminism and the Critique of Colonial Discourse. Inscriptions 3-4: Center for Cultural Studies. Retrieved from http://www2.ucsc.edu/culturalstudies/PUBS/Inscriptions/vol_3-4/minh-ha.html.